A pizza recipe which combines delicious, authentic flavours from the South. Preheat the oven to 220'C (gas mark 7). Cut the courgettes into 1cm thick slices. Peel the garlic cloves, then finely chop and mash to a fine puree. Then mix the garlic puree into the cream. Cut the slices of parma ham into 3. In a hot pan with a drizzle of olive oil, colour the slices of courgettes on each side and season with salt. Roll the pizza dough onto a baking sheet. 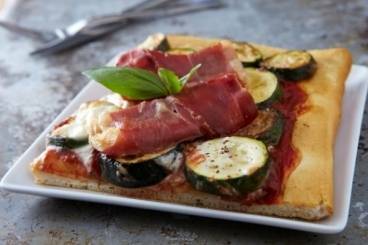 Then, spread the tomato sauce a few centimetres thick and top the pizza with sliced courgettes. Then drizzle with the garlic cream. Finish with the sliced parma ham. When cooked, remove from the oven and add a handful of rocket leaves.